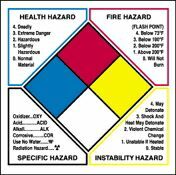 Title: 05/06/1991 - Regarding labeling requirements of the OSHA's Hazard Communication Standard. This is in further response to your letters of February 15, addressed to both myself and Mr. Roderick DeArment, Deputy Secretary of Labor, regarding the labeling requirements of the Occupational Safety and Health Administration's (OSHA) Hazard Communication Standard (HCS), 29 CFR 1910.1200. As I mentioned in my interim response to you of March 13, Mr. DeArment had provided me with a copy of your letter to him and asked that I respond to you directly. We are also in receipt of your letter and supporting documentation to OSHA's Columbus, Ohio, Area Director, Mr. James E. Vaughan, of January 9. This letter will also respond to the similar concerns you raised in that correspondence. OSHA's policy regarding the labeling of hazardous chemicals for carcinogenic effects is discussed at length in the Agency's Compliance Instruction for the Hazard Communication Standard, CPL 2-2.38C ("Inspection Procedures for the Hazard Communication Standard," October 22, 1990, copy enclosed). As you have correctly stated in your letter to us, the existence of positive human evidence, based on one valid study conducted in accordance with established scientific principles indicating carcinogenic effects in humans triggers the requirement that the label contain an appropriate carcinogen hazard warning. It is the responsibility of the chemical manufacturer or importer of a product to identify and evaluate all relevant scientific data when conducting a hazard determination. A review of the available scientific literature for health effects associated with exposure to fibrous glass products was conducted by our Directorate of Health Standards Programs. Several epidemiological studies of fibrous glass production workers were found which showed a statistically significant increase in respiratory tract cancer. Therefore, appropriate hazard warnings on fibrous glass products would have to indicate that fibrous glass may cause lung cancer in humans. A copy of this letter to you will be sent to each of OSHA's Regional Offices and included on OSHA's Computerized Information System (OCIS), the Standards Interpretation File, so that our compliance staff will be informed of and have access to this interpretation regarding the requirement of chemical manufacturers and importers, under the HCS, to positively label fibrous glass products with a carcinogen warning label. If, upon inspection, an OSHA Compliance Officer becomes aware of incorrectly labeled fibrous glass products being used in the workplace, according to OSHA referral procedures, the chemical manufacturer will be contacted and asked to correct the hazard. Referral procedures for the abatement of incorrect labels are set forth in section X.7.a. (7) of the enclosed OSHA Instruction for your information and reference. We hope this response sufficiently addresses the concerns you raised. Please feel free to contact us again if we can be of further assistance.